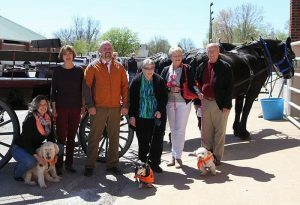 Pacemaker Posse pet owners attending the reunion were Maureen Cancienne, Rebecca Dees, Ken and Susie Sharp, Patricia Wayman and Mary Jo Wipperfurth. Baumwart made a presentation to Open House attendees about veterinary cardiology. Several owners shared their heartwarming stories of how a pacemaker changed their pet’s life. Patricia Wayman and Abby of Goltry, Okla. “About a year ago, I really noticed that Abby would be moving and then she would just go down,” says Wayman. “I thought, well, she’s tired.” Wayman noticed that it was happening more and more. “It just broke my heart. She would bounce back up but I just didn’t know that one of these days she wouldn’t get back up. I was fortunate enough that my veterinarian, Dr. Carey Bonds (OSU ’03) at Trinity Hospital, told me about Dr. Baumwart. We came over and they ran all the tests.” Dr. Baumwart diagnosed Abby with sick sinus syndrome. “The decision of what to do?” adds Wayman. “My family is farmers. Abby is not a farm dog; Abby’s my child. So we talked about it and talked about it. Now in the small town that I live in, Abby’s the bionic dog. Everybody talks about, ‘Do you know that we’ve got a dog in Goltry that has a pacemaker?’ I would do it 100 times again.” Abby received her pacemaker in September 2015. She turned 11 in May 2016. “Blockages like GiGi’s are another common condition that we treat with pacemakers,” confirms Baumwart. “Rarely do we see the need to treat fast heart rates in dogs with pacemakers.” According to Dr. Baumwart, when there is an atrioventricular blockage this can cause infrequent or no transmission of normal sinus node conduction to the ventricle. “The sinus node is trying to fire but it’s not getting the normal conduction system. There’s a backup pacemaker that’s firing at a very low rate that doesn’t allow the dogs to have a normal blood flow. They may cause dogs to pass out because of this as well,” explains Baumwart. Human pacemakers are used in dogs. The device is about the size of a silver dollar. The pacemaker carries the computer and battery inside of it. The lead plugs into the generator and the other end of the lead is placed inside of the dog’s heart. “There are two different types of leads: a passive fixation and an active fixation which actually screws into the muscle of the heart,” says Baumwart. “We put those in using a specialized x-ray called a fluoroscopy. It allows us to look at a live image as we put the lead inside of the heart. Once it is secured, we place the generator underneath the skin in the neck of the dog. Sometimes you can feel the generator and sometimes you can’t. According to Baumwart, the biggest barrier with pacemaker surgeries is the cost of the surgery. “We recently started using a company that provides animal pacemakers at a much reduced cost compared to the human pacemakers,” he says. “However, this can still be a large amount of money for the average pet owner. If you would like to support the veterinary cardiology unit at OSU’s Veterinary Medical Hospital, contact Heidi Griswold at hgriswold@osugiving.com or 405-385-5656. 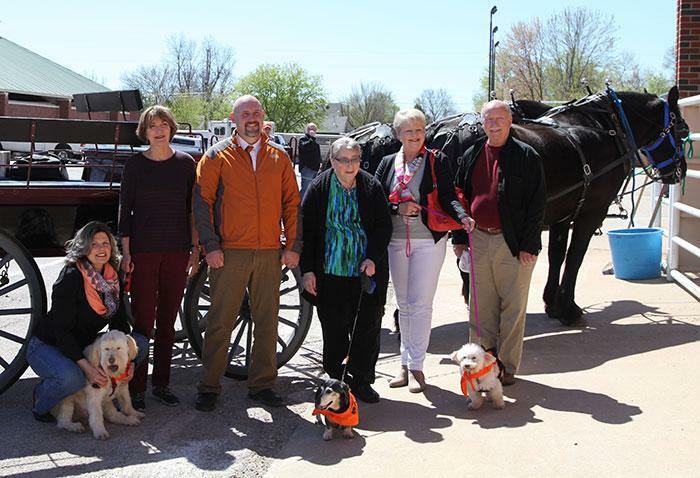 Pictured (above) left to right are: Brandy Hutchings, veterinary assistant, with Percy, owned by Rebecca Dees, Dr. Ryan Baumwart, Mary Jo Wipperfurth with Snoopy and Susie and Kenneth Sharp with Gigi. Also attending but not pictured were Patricia Wayman with Abby and Maureen Cancienne with Sassy.